Animals are sentient beings that should be allowed to remain in their natural habitat and engage in innate behavior. Animals used for profit in the entertainment industry can be subjected to inhumane methods of training, and are afforded only minimal protection under federal law. The Animal Welfare Act is not adequate to protect the millions of captive animals under the jurisdiction of the US Department of Agriculture. ADLA has worked for decades to protect Arizona animals in entertainment including animals in circuses and zoos, and greyhounds in the dog racing industry. ADLA also helped lead the citizen initiative that outlawed cockfighting in 1998. 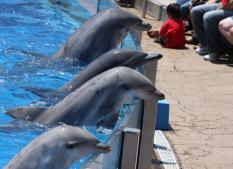 ADLA is currently involved in a campaign opposing captive dolphins. Learn more about ALDA’s Dolphin Anti-Captivity Campaign here.